Though composer Henry Jackman has worked in various music departmentÂ roles on such high-level blockbusters as The Dark Knight, Hancock, The Da Vinci Code, two of the three Pirates of the Caribbean films, The Simpsons Movie, and Kung Fu Panda, the score for the upcoming Monsters vs. Aliens marks his debut as the lead composer for a feature. And from the sound of the tracks here, it appears that Jackman has been paying attention on all his assignments. He’sÂ able toÂ pull togetherÂ the action sensibilities of The Dark Knight and Hancock – check out the intensely pounding “Do Something Violent!” with its super-fast-paced tempo and full orchestralÂ involvementÂ – with the cartoonish elements of The Simpsons Movie and Kung Fu Panda – “Meet the Monsters” is a hip, quirky piece that feels like an extended, spruced up sitcom introduction with jazzy Lilo Schifrin elements thrown in for good measure. Monsters vs. Aliens is a thrilling score that mixes darkÂ superhero themes with childlike wonder, at times sounding like John Williams’ Superman score – listen to the opening of “Oversized Tin Can” and tell me I’m wrong – and at other times sounding like a goofy kid pleaser – okay, now check out the second half of “Oversized Tin Can.” For the most part Jackman’s score, produced by the reveredÂ Hans Zimmer, is an exercise in almost Disney-like enthusiasm.Â There are few moments that don’t includeÂ the majority of the orchestra, resulting in a powerful, full-bodied, multi-layered sound. But Jackman has enough sensibility to throw in hip, poppy references, allowing the sound to stay grounded andÂ fun no matter how expansive the instrumentation gets. He even manages to get (cartoonily) emotional with the brief and a bit over-explanatory “Didn’t Mean To Crush You.” Jackman has set himself up as a powerful contributor to both the animated world and the action world in general. 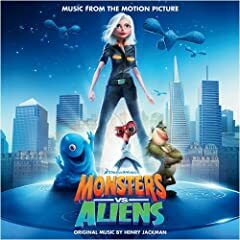 No user commented in " Music Review: Music From the Motion Picture Monsters Vs. Aliens "